Losing valuable time monitoring fires for days on end has been a major factor prompting North Hyden brothers Paul and Colin Green to switch from a chaff cart system to the Harrington Seed Destructor (HSD) for weed seed removal at harvest. Since 1997, they have been using chaff carts across their property in the fight against ryegrass that is resistant to Group A and B herbicides and wild radish that is resistant to Group F actives, such as Brodal®. But it was taking up to three months to burn chaff dumps, which put a big dent in labour resources, created high fire risks and removed valuable stubble cover. “The risk of fire in unwanted places is just too great to continue with this form of weed control and using labour to watch chaff fires for such a long period is a luxury,” Paul says. “We have also noticed a build up of weed numbers in areas where the chaff dumps have been put year after year because not all seeds are burnt. The Green brothers purchased a HSD last year but, after covering 250 hectares, design issues and mechanical failure meant it could not be used for the remainder of that harvest. A new cage mill for the machine has been built for this year’s harvest by deBruin Engineering, which is the exclusively licensed manufacturer and distributor of the HSD. deBruin has also made several key improvements to the original design, including a move to a simplified hydraulic drive rather than belts and a clutch. It is expected to be one of four HSD machines in commercial use on Western Australian farms this harvest. The HSD technology was invented by Darkan grower Ray Harrington and commercialised with support from the GRDC, the Australian Herbicide Resistance Initiative (AHRI) and the University of South Australia. retaining organic matter in the paddock, rather than burning it. AHRI research has shown the HSD can crush and destroy at least 95 per cent of ryegrass weed seeds, 99 per cent of brome grass and wild oat seeds and 93 per cent of wild radish seeds that exit the header in the chaff fraction during harvest. 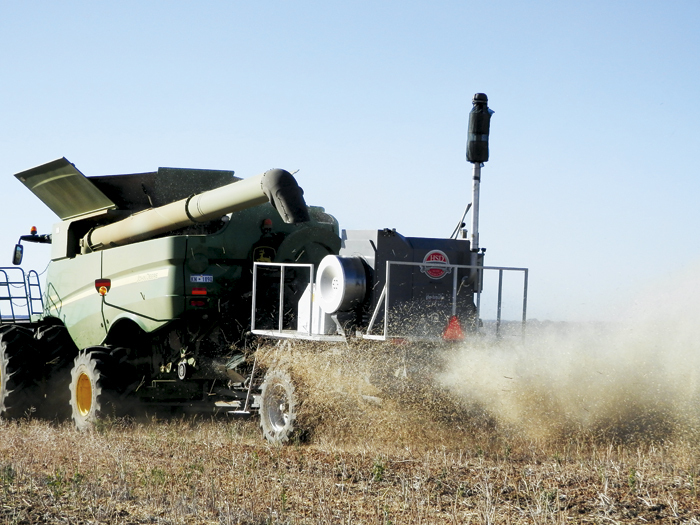 AHRI and University of Melbourne trials at 14 sites across southern Australia during the 2011-12 harvest showed the HSD system was as efficient as narrow windrow burning and chaff carts in removing seed and reducing autumn weed germination. 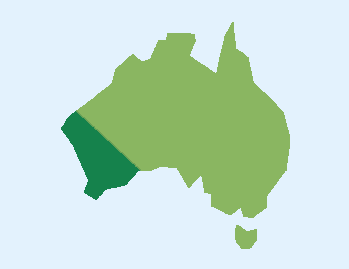 All harvest seed destruction treatments reduced annual ryegrass emergence by an average 55 per cent across the trial sites. The long-term (10-year) cost of the HSD, including capital outlay and operating, is estimated to be similar to that of chaff carts and windrow burning at about $12/ha. Paul says he thinks it will cost less to run the HSD on his property, but the initial capital outlay will be hard for some growers to meet. He says harvest operations should be marginally faster after the switch from a chaff cart to HSD, but not as fast as conventional harvesting because the header needs to run close to the ground to collect weed seeds. The Greens plan to tow their HSD behind a John Deere S680 harvester with a 12-metre front. The deBruin HSD is available for delivery this year to Australian growers and is able to be modified to most models and brands of harvester. Interested customers should contact John Millhouse at deBruin. Read this article in GC West issue 106 - Subscribe and recieve the hard copy of GroundCover in your mailbox for free, remember to select 'Post' as your subscription method.